What makes LECT2 Amyloidosis Unique? Many different proteins can cause amyloidosis. 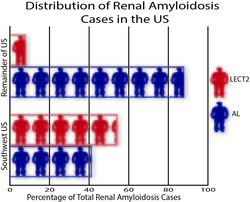 The most common forms of renal amyloidosis are called AL amyloidosis, AA amyloidosis, and LECT2 amyloidosis. What makes LECT2 amyloidosis unique is that although LECT2 amyloidosis only accounts for 5% of amyloidosis cases, many patients tend to be from certain ethnic backgrounds as well as from certain areas of the U.S.
Amyloidosis occurs when a protein that is normally soluble in the blood becomes insoluble. In LECT2 amyloidosis, the LECT2 protein will deposit in the kidneys, resulting in symptoms typical of kidney failure.